Wadada centre exists to empower young girls aged 7 – 25 years to advocate for their own rights to live free from sexual abuse and exploitation through the use of Solution Focused Approach, Capacity Strengthening, Entrepreneurship Skills acquisition and Public Awareness campaigns. Wadada Centre for Solution Focused Approach (Wadada) is a registered vibrant young women-led nongovernmental organization founded in 2011 by Kivulini Women’s Rights Organization (www.kivulinitz.org) through its Youth Engagement Programme aiming to empower young girls to advocate for their own rights to live free from sexual abuse and exploitation. The word “Wadada” means ‘sisters on solidarity’ is purposely used to indicate that the organization aims at empowering young girls to live from sexual abuse and exploitation. Wadada overall intention is to strengthen the capacities of young girls (in/out of school) with appropriate knowledge and skills to defend for their human rights to live free from sexual abuse and exploitation using “Solution Focused Approach” that emphasizes a client/individual has a solution and abilities to direct oneself life. As the saying goes, who wears the shoes know best where it pinches. Wadada believes that young girls know how their situations can be improved. Therefore, they should be on the forefront in ending it now and the future. 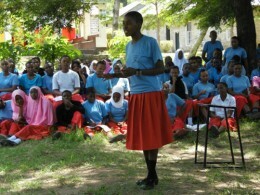 Other strategies that Wadada uses include advocacy in holding the government and community accountable in creating safe environment for girls to grow their full potential, economic empowerment among young girls and public awareness to inform the community on the rights of girls to live free from abuse and its consequences when their rights are abused. In the community young girls are safer and growing to their full potential free from sexual abuse and exploitation. Wadada exists to empower young girls 7– 24 years old to advocate for their own rights to live free from sexual abuse and exploitation through use of Solution Focused Approach, Capacity Strengthening, Advocacy, Entrepreneurship Skills and Public Awareness. To strengthen the capacities of young girls age 7-24 to advocate for their own rights to live free from sexual abuse and exploitation. Wadada Centre for Solution Focused Approach added 2 News updates. Wadada Centre for Solution Focused Approach created a Volunteer page. Wadada Center for Solution Focused Organization seeking for National and International Volunteers with defferent proffessional/experts specificaly on fundrising, monitoring, Evaluationa and Reporting. Wadada Centre for Solution Focused Approach added FORWARD UK to its list of Partner Organizations. Wadada Centre for Solution Focused Approach added terre des hommes schweiz to its list of Partner Organizations. Wadada Centre for Solution Focused Approach added 5 News updates. Young Girls Celebrating after being trained on Solution Focused Approach in Ilemela District.